Di Morelli Brightener Serum is a chemical-free alternative to lighten hyperpigmentation in the skin. 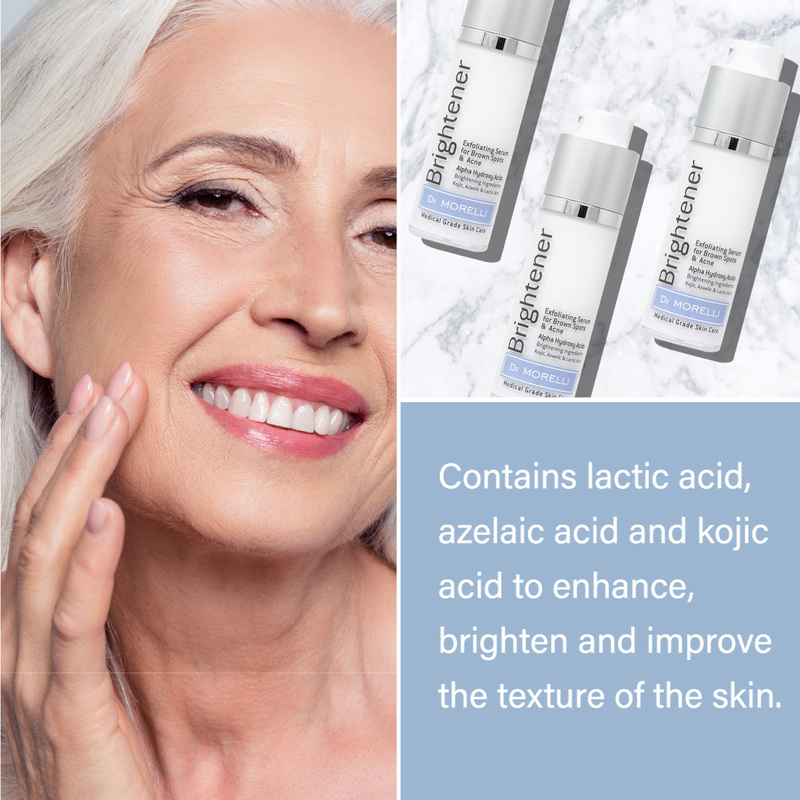 This brightening treatment combines 3 natural acids to lighten the appearance of dark spots and exfoliate the skin to reveal a brighter, more even complexion. ** Please limit sun exposure and apply Di Morelli SPF 35 while using Brightener Serum and for a week afterwards. Apply 1 pump on clean skin avoiding eye area. For best results, apply in the evening. A mild tingling sensation is common upon application. Use SPF during day. Alpha hydroxy acid extracted from sour milk and sugars, although most forms used in cosmetics are synthetic. Mildly exfoliates the skin without causing irritation. Found in wheat, rye and barley. Helps to lighten the appearance of hyperpigmentation (brown spots), calms inflammation in the skin. Derived from rice, soy and mushrooms. An effective tyrosinase inhibitor, it helps prevent melanin production as well as exfoliation. After hearing concerns about dull, aging skin from our clients, we wanted to provide a product that would bring vitality back to the skin. We created a targeted solution with the Di Morelli Brightener. We used clinically studied ingredients, a blend of naturally derived acids to improve skin’s tone and texture. Using active ingredients that are organic compounds found in nature, we created this brightener to noticeably revitalize skin at any age.